Are you heading someplace fun and exciting for spring break 2019, but can’t take your dog with you? Sure, you can always ask friends and relatives to pet sit for you, but there are many reasons to rely on our dog boarding experts instead. Here at Eagle Animal Hospital and Pet Resort, we want your pet to be happy and healthy while you’re away. Here are four reasons why you should consider boarding your dog when you go on your spring break adventure. When you’re ready to find boarding services, rather than searching “dog boarding near me,” all you need to do is contact Kansas City’s Top Rated Local® pet resort to book a stay for your dog. Our priority is ensuring your pup’s safety, health, comfort, and well-being during their stay with us. As an extra perk to ensure your peace of mind, you can check in on your dog vis Snapchat at eagle_daycare where you can follow their daily activities. Our highly trained kennel team is made up of experts who love what they do. They have the experience and drive to ensure your pet’s stay is as comfortable and as stress-free as possible. They have cared for thousands of dogs and are passionate about caring for each and every pup as if they are our own. Our attentive boarding staff can recognize behaviors signaling when there may be a problem and have the training to handle the situation with every pup’s health and safety in mind. Additionally, we understand that each dog is different, which is why we provide personalized care to ensure their needs are met. We will maintain their normal feeding schedules and, if they require medication, they will be given their meds according to their schedule. Because we are also Kansas City’s favorite animal hospital, that means that your furry friend will have immediate access to compassionate veterinary care should an emergency arise such as illness or injury. Keep in mind that our goal is to provide pet parents with confidence and peace of mind knowing that their fur babies are being cared for by experts in their field. Additionally, we have designed our facility to be safe and secure to prevent injuries. While you’re enjoying spring break on a beach somewhere tropical, your dog can enjoy the company of other dogs and humans. Socialization is essential for all dogs, and while some are more timid and anxious around other dogs, many are fine to be around other pups. Of course, we will determine their socialization skills during their temperament test to ensure the safety of your dog, other dogs, and our staff. 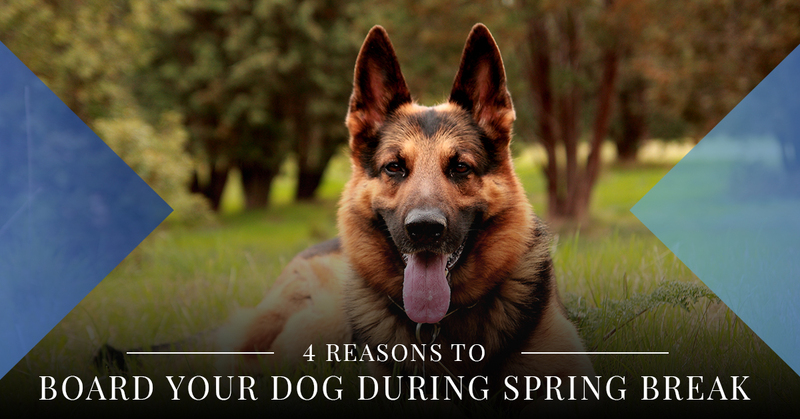 There are so many reasons to board your dog while you’re on spring break! When you’re ready to board your furry best friend, don’t spend hours searching for “dog boarding near me” or “pet boarding near me,” when Kansas City’s Top Rated Local® pet resort is only a call or a click away! Here at Eagle Animal Hospital and Pet Resort, our dedicated team of pet resort pros is here to care for your dog as if they are our own while you’re away. Our state-of-the-art boarding pet resort is outfitted with plenty of indoor and outdoor space for your dog to play and socialize with other dogs and other humans. We will customize their stay to match their unique needs according to your preferences and requests. Contact us today and find out why we’re Riverside’s favorite pet resort!